Porto is the perfect city to visit for a weekend escape. Why? Because this laidback, riverside metropolis offers plenty to do in 48 hours, but not so much that you’ll feel like you missed out and should have stayed longer. Porto is colourful, cobbled together and charming. Its UNESCO listed centre, with mismatched houses, traditionally tiled churches, and hilly alleyways (where you’ll see the locals’ washing dangling above your head), give you a glimpse into Porto’s rich history and everyday life all at once. It’s a city of breath-taking vistas, authentic Portuguese culture and quirky architecture and design. And of course, it’s the home of port wine. 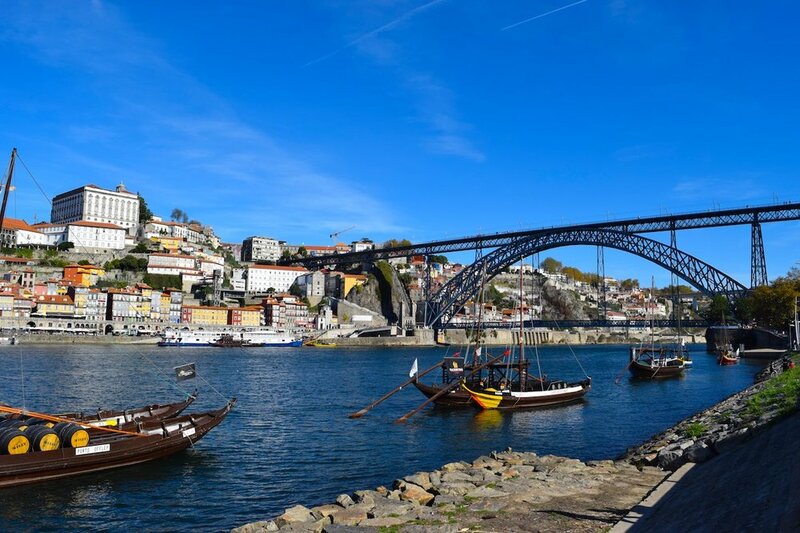 If you want to get the most out of two days in Porto, the below itinerary is for you. The city’s waterfront, Cais da Ribeira, is the liveliest and most photogenic spot in Porto. 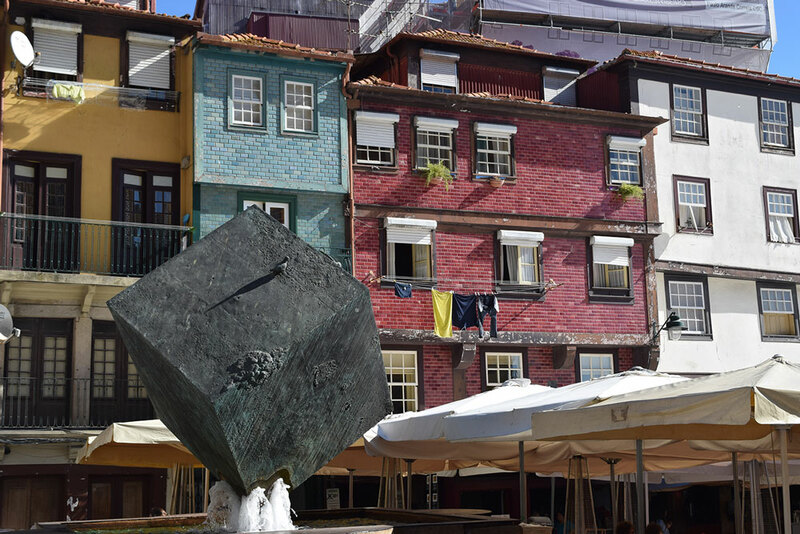 This is where you’ll find the mismatched, higglety pigglety colourful houses that, along with the Duoro River and the Dom Luís I Bridge, best sum up the city. In my opinion, this is the first place anybody who arrives in Porto should head to soak up the relaxed and quirky vibe of the city. Walk along with camera in hand and take in the views as you make your way to the Dom Luís I Bridge. Porto has six bridges but the Luis I Bridge is its most imposing and famous, connecting Porto’s Cais da Ribeira with the other side of the city, Vila Nova de Gaia. The bridge was designed and constructed between 1881-86 by German engineer Théophile Seyrig. Interestingly Seyrig was a former student and colleague of Gustave Eiffel – who of course gifted the world the Eiffel Tower. The two had worked together previously on another of Porto’s bridges, the Maria Pia, and both submitted proposals to build the Luís I Bridge however Seyrig’s plan beat the project proposed by Eiffel. 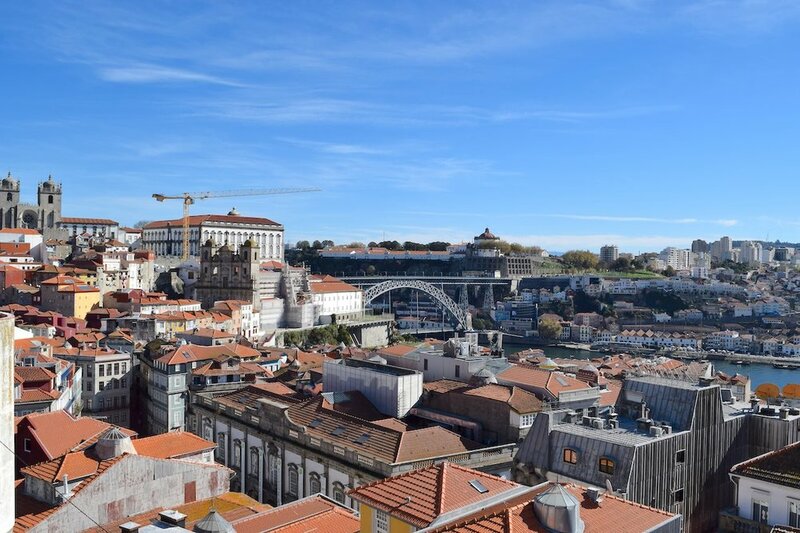 Today the bridge offers a panoramic view of Porto to tourists from a number of different angles, as you can walk along both its lower and upper decks, taking photos of the city below you. Rather than being simply a suburb of Porto, Gaia is technically a city that sits south of the Douro River from Porto. But for tourist purposes, you can just think of it as south Porto (I hope none of my Portuguese friends are annoyed at me for saying that!). If you walk over the Luís I Bridge from the Cais da Ribeira side, you’ll find Gaia, and all the port houses you could ever imagine in one spot. Along the water, you’ll also see the traditional port boats, known as barco rabelo, bobbing around in the Douro River. The boats used to carry the barrels of port down the river from the valley where it was produced to Gaia where they would be stored and shipped. Today, they’re really just there for show. Once you’ve wandered along the key, turn back and make your way up the hill for beautiful views Porto, from Gaia’s best viewpoint, the Mirador do Serra do Pilar. Doing a tour of a port house in Porto is a tad cliché and touristy, right? So should you do one? I’ve done a few winery, whisky and brewery tours in my time and I figured it’s all pretty similar, so I was tempted to skip this. But I’m so glad I didn’t because port is so quintessential to the region that doing a tour meant I learnt about Porto’s history and the nearby wine regions of the Douro Valley. On my sister’s recommendation, I visited Taylor’s Port House, which has a well-curated and fascinating self-guided tour for €12 per person. The tour took my about 1.5 hours and at the end I was given two complimentary glasses of port wine to try out in the sunny courtyard. Porto is of course famous for port, but there is another wine that is well worth trying while you’re in city. Vinho verde, literally means ‘green wine’ but it translates as young wine and can be white, rose or even red in colour. This light and refreshing wine that has a slight fizz is from Portugal’s Minho province, which is northernmost part of Portugal. On a sunny day in Porto, there’s nothing better then sitting outside and sipping on a cool glass of vinho verde. I’d recommended grabbing a glass at Bar Ponte Pensil and watching the sunset over the mountains. There service is a little slow, but it is worth it for the views – get there a little early to get a good seat on the balcony as plenty of other tourists will have the same idea. This is another free and breath-taking viewpoint and place to take some photos of Porto from above. 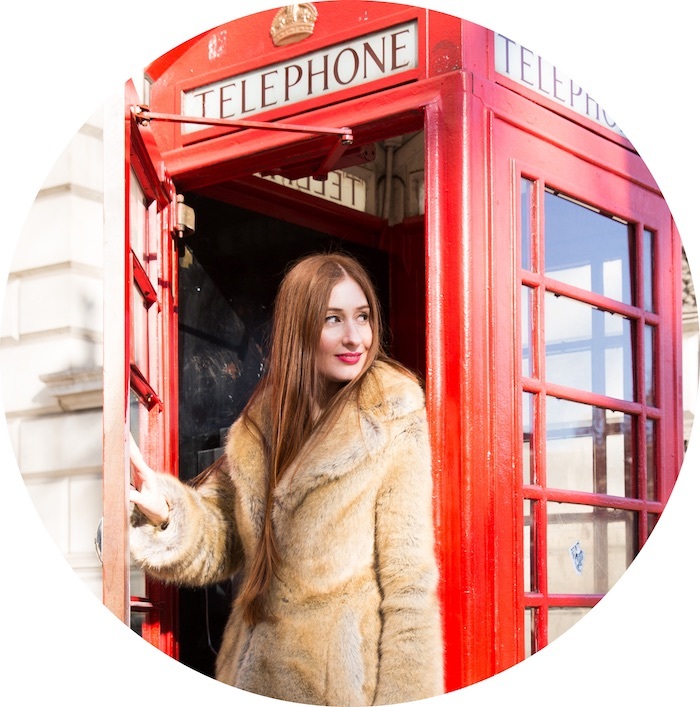 It’s often referred to as the most beautiful bookstore in the world and rumoured to have inspired J. K. Rowling’s description of the Harry Potter library. While it’s magical inside, be warned; you won’t have the shop to yourself. It’s become so popular that you now need to buy a ticket (that costs €4 and can be purchased from a nearby corner shop) and line up to get in. The bookstore has a marvellous, grand staircase leading up to a second floor with a striking stained glass ceiling. As it gets so busy, I suggest going first thing before heading onto the Palacio de Cristal Gardens. Porto’s botanical gardens are somewhat deceiving – as you wander through the flowers, sculptures, manicured hedges, fountains and even peacocks you’ll be impressed but not blown-away. But keep going and you’ll find the best part – their view of the winding Douro River, vineyards and the city from afar. As the gardens are slightly out of the way, there is a really relaxed vibe here and plenty of different angles to capture the Douro River from. From here, head back towards the old town and make your way to Clerigos Tower. Porto is a city of panoramic views – in some ways it feels like you’re going from location to location getting slightly different angles of same vistas. So you might question whether paying €5 and walking up the 240 steps needed to get to the top of Clerigos Tower is worth it for yet another aerial view. But I think it is, because unlike the other viewpoints, which have the Douro River as their focal point, Clerigos Tower let’s you peek into into the zigzagging streets of Porto’s historical UNESCO listed centre. Fun facts about the tower: when it opened in 1763 it was Portugal’s tallest building, and in 1917 a Spanish father-son acrobatic duo scaled the outside of the tower to reach the top in front of a large audience. See footage of it happening. Palacio da Bolsa is a short walk from Clerigos Tower and translates to…wait for it…the Stock Exchange Palace. Doesn’t sound very exciting, does it? I almost didn’t bother with the Palacio da Bolsa, as when I was in Porto the weather was stunning and I just wanted to be outside soaking it up (how British I’ve become), but I’m so glad I did. If you asked me, this extravagant, over-the-top building is well worth the €9 price tag for a 30 minute guided tour (the only way to see it). 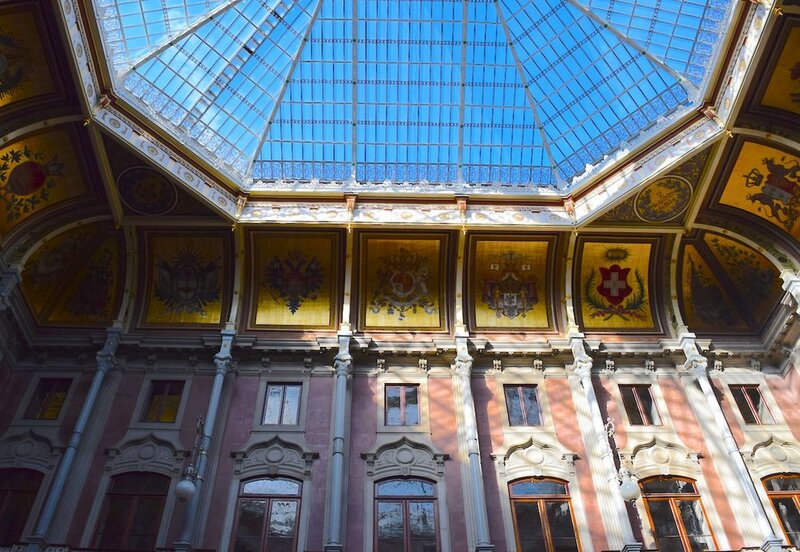 Built between 1842 and 1910, to add to the city’s credibility and impress European investors, the former stock exchange, which is no longer the centre of trade for Porto, must have been one of the most opulent in the world in its heyday. The tour starts in the glass-domed Pátio das Nações (Hall of Nations), which is decorated with the coats of arms of the countries who were Porto’s most important trading partners (sadly Australia was not included!). You’ll then tour through many beautiful rooms, with interesting histories. But the show stealer of the tour is the Salão Árabe (Arabian Hall), which is a massive ballroom inspired by the Alhambra Palace in Granada and gilded with 18kgs of gold. The room alone has to be one of the crowning jewels of the city. Interesting fact: Much of the ‘wood’ you see inside the palace is actually plaster painted to look like wood. Despite that being a complete faux pas today, at the time of building this technique was in vogue because it allowed artists to show just how good they were. Once you’re finished with the tour, head to the church next door. What looks like a pretty standard church from the outside, is extraordinary inside. The interior of this lavish church is covered from head to toe in what’s estimated to be 100kgs of gold leaf. No, I haven’t gone crazy. This is probably the fanciest McDonald’s you’ll ever eat fries in, so I highly recommended stopping by – even if just to take a look. Porto’s McDonalds (just near the main station of Sao Bento) opened in 1995 in a building that was formerly a famous iconic coffee shop called the Imperial. The building retained many of the original art deco features, so when you’re standing in line you can admire the giant stained glass wall behind the counter, the ornate ceilings and even chandeliers. Sao Bento is one of Porto’s main train stations, and its most beautiful, thanks to its striking atrium, covered from wall-to-ceiling in stunning tiled panels that depict stories of Portugal’s past. The blue and white tiles illustrate several historical Portuguese events, such as its wars, royalty and the history of transport in the country. Tip: As the station is so busy, if you want a good photo you’ll need to get there extra early to avoid peak times. The cathedral itself is pretty without being the most beautiful in the city, but entry is free, so it’s worth a peek. If you have a couple of euro to spare, I’d also recommend paying to see the monastery and outside courtyard which is decorated by beautiful Portuguese-style hand-painted blue and white azulejo tiles – it's stunning. And finally, don’t leave Porto without eating one of the city’s artery-clogging delights, the francesinha. I’m told the sandwich is the Portuguese take on the French croque monsieur and after having one all I can say is its delicious, but make sure you’ve brought your appetite. The sandwich is made with bread, ham, smoked sausage and covered with melted cheese, an egg and smothered in a hot sauce. It’s served with french fries and with a Superbock beer. I had my first, and maybe last (! ), francesinha in a local cafe with two lovely Portuguese friends, so for most tourists the location will be out of the way. But if you search online there are plenty of places in the city to get one.